Killer Croc: I threw a rock at him! Poison Ivy: [ignoring Croc] So, Harvey, what became of the giant penny? One thing that seems true regardless of where you are is that people can come up with some creative and scary ways to hurt each other. But what does someone do when conventional weapons aren't available, they aren't interested in or skilled at hand-to-hand-combat, and when they are in a rush? For the strongest and bluntest of characters, attacking their enemy with a rock will suffice. This signals a few things about the character. One is that they are physically strong or at least going through enough of an adrenaline rush to gain some strength. This character is typically focused on doing the most damage they can as easily as possible, often marking them as a Combat Pragmatist or a primitive brute. Another possibility is that the character, for whatever reason, doesn't have another weapon to use and is acting out of desperation. Whether they're desperate or just brutish, however, one fact remains the same: they want to do some damage, and are willing to resort to literally crushing someone with a stone to accomplish their goal. To apply, the weapon need not be a rock specifically. Concrete, bricks, cinder blocks, and other rock-like objects can count, as well. Truth in Television, of course; a decently-sized rock will do just as well as any other bludgeon in the event that you need to defend yourself quickly. When turned into a superpower, this is Dishing Out Dirt. Subtrope of Improvised Weapon. "The Cobblestone Is the Weapon of the Proletariat" ◊ is a famous sculpture by the Soviet sculptor Ivan Shadr, symbolizing the worker class' struggle against exploitation. 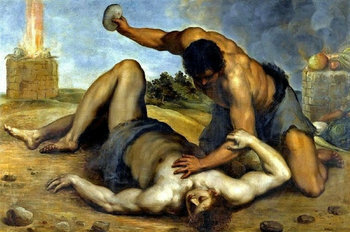 It depicts a shirtless worker prying out a large cobblestone from the street to use as an improvised weapon in his rebellion. In Akame ga Kill!, alchemist Dorothea modified her own body to the point that she's able to survive having her neck broken. Leone responds to this by picking up a giant boulder and crushing Dorothea's entire body with it. In the 2nd season opening credits for Bleach, Chad is shown ripping a huge slab of stone out of the ground and throwing it at a group of approaching Soul Reaper combatants. Asterix: Big Guy Obelix sometimes uses a menhir (a large, pointed, prehistoric rock) to bludgeon or crush his opponents. In Asterix and the Big Fight, this tactic comes back to bite him however when he tries to hit some Romans with a menhir, but ends up hitting Getafix instead, giving the druid amnesia. In Neither a Bird nor a Plane, it's Deku!, Izuku digs his fingers into the ground and chucks a hunk of asphalt large enough to rip off the giant zero-point robot's arm with a glancing hit during the U.A. Entrance Exam. During the climax of Snow White and the Seven Dwarfs, the dwarfs corner the evil Queen at the top of a cliff. Enraged, the Queen tries to dislodge a nearby boulder onto the dwarfs. It nearly works, until a bolt of lightning strikes the Queen from her perch to her death. Dark Passage opens with the wrongfully accused Vincent Parry escaping from prison and getting a lift from a passing motorist, Baker. When Baker realizes who his passenger is, Vincent punches him out of the car, knocks him unconscious, then desperately grabs a rock to kill him with. But before he can become a murderer for real, Irene (the one person who knows Vincent is innocent) shows up and persuades him not to go through with it. In Labyrinth, Sarah throws rocks at various goblins' heads in order to stop them from attacking the imprisoned Ludo. Never Hike Alone: Kyle has so far had zero effect in his fights with Jason, and has just been disarmed of his only defense against his machete and thrown violently to the ground. In desperation, he grabs a rock and smashes Jason in the face with it, knocking his mask off. This being Jason, knocking his mask off is all it does, and even that's quickly fixed. In The Princess Bride, Vizzini (the brains of the bad guy trio) is the one who insists that the giant Fezzik should smash the Man in Black's head in with a huge rock—but Fezzik actually prefers a fairer fight. When the Man in Black does show up, Fezzik deliberately misses with the first rock, just to prove that he could have killed him, then challenges the Man in Black to a fight without weapons. Fezzik: Oh good, my way. Thank you Vizzini... What's my way? Vizzini: Pick up one of those rocks, get behind a boulder, in a few minutes the Man in Black will come running around the bend. The minute his head is in view, hit it with the rock! Fezzik: My way's not very sportsmanlike. The Ewoks from Return of the Jedi toss large rocks down upon a squad of Imperial troops. Though their Imperial armor mitigates the damage, the impacts nonetheless knock them off their feet. At the climax of Tumblewood, Lam attempts to smash Jim's head in with a rock. However, when he misses, the rock causes him to overbalance and he falls to his death of the cliff. Thresh, after believing that Clove had killed his young district partner Rue, had gotten so enraged that he killed her by smashing her head with a large rock. The unnamed victor of the 73rd Hunger Games, whose arena was the ruins of an abandoned city, had killed the runner-up by beating him with a brick. Beyond Belief: Fact or Fiction: One short story involves a murderer who killed a man by smashing his head in with a chunk of asphalt. He gladly recounts this story to his cellmate... who turns out to be the victim's father, who isn't too happy to hear it. Episode "Arena". Captain Kirk and the Gorn captain are forced to fight each other with improvised weapons. During their battle, the Gorn captain picks up a boulder and throws it at Kirk, pinning Kirk's leg to the ground. "The Galileo Seven". While the crew of the shuttle craft is trapped on a primitive planet, they are attacked by giant cavemen-like humanoids. One of the cavemen uses a boulder to pound on the shuttlecraft. During a funeral ceremony, one of the cavemen throws a boulder at Spock, pinning him to the ground. The Flash (2014): In the season 5 episode "Goldfaced", a temporarily depowered Ralph and Bary have to fight off Goldface's gang. Barry tries to toss Ralph a brick to use as a weapon, and ends up hitting one of the criminals instead, knocking him out. Dungeons & Dragons. If giants have boulders nearby they can pick them up and throw them at their opponents instead of using their normal melee weapons. The giant round boulder-wielding Infested Barbarians in Dark Souls I are much more dangerous than the regular club-wielding kind, thanks to their extended move set, which includes slamming you (repeatedly) into the ground with the boulder, charging you from a distance by rolling the boulder in front of them, or just throwing their boulder at you from range (and immediately summoning another one into their hands). Disarmed Bokoblins and Moblins in The Legend of Zelda: Breath of the Wild will occasionally throw rocks projectiles. Bokoblins pick up small ones from nowhere, while Moblins use the large ones scattered around the overworld (which Link can also use). Street Fighter: One of Cody's dirty fighting tricks is to pick up some stones and then throw them at people mid-fight. Later on, in Street Fighter V, he's got a variant; he can toss up a stone and then punt it with his steel pipe like a baseball to hit enemies at range. After he and Jay are attacked by "Masky" and manage to not only defend themselves but take him down long enough to unmask him (finding their friend Tim), Alex, after being told he can't kill him, instead smashes his legs with a nearby rock to cripple him. He starts to become paranoid after Jay has been spending weeks doing nothing but stalking him. When a man innocently approaches him from behind, Alex goes into a fit of rage and murders the man with a rock, believing it to be Jay. This murder is seen on a video taken by totheark in order to expose Alex's crime. In The Powerpuff Girls episode "Meet the Beat-Alls", while the other villains bring high-tech weapons (and in the case of HIM, magic) to fight the Girls, Fuzzy Lumpkins only has a boulder. However, he's the one who delivers the final decisive blow against the Girls by dropping it on them while they're immobilized by the other villains' attacks.